The news broke a few weeks ago, but it will always be relevant. 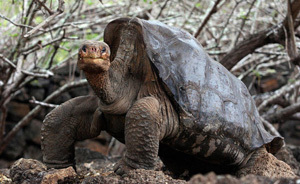 Lonesome George, the world’s last Pinto Island Tortoise and a recognized symbol of the Galapagos, died on June 24th, 2012. If you have ever been to the Galapagos Islands, there is a good chance you saw him. Discovered in 1971, he grew slower and more lackadaisical as the years came and went, but he was still a wonder. The last of his species, he was a living reminder of the dangers that accompany a human presence. We’d like to take this week to acknowledge the species of the Galapagos that are still in critical danger of extinction. According to the Galapagos Conservancy, we know of thirteen vertebrate species that are now extinct, and of those, humans have witnessed seven of them cross the threshold into non-existence. A critically endangered species is one that will be extinct soon unless the most drastic measures are taken right now to save it. There are currently one tortoise, one snake and four bird species categorized as critically endangered. There are twenty six invertebrate species on the critically endangered list, as well as twenty plant species. Finally, three marine species are facing near extinction. The cause for the disappearance of these species has been the same since Charles Darwin landed there in the late 19th century. An added human presence to this tiny ecosystem has led to habitat loss and fragmentation, the arrival of introduced species and diseases, hunting, increased tourism and global warming. But none of this is news to us, is it? These are all factors we’ve heard of before. Thousands of travelers want to see the Galapagos, and rightly so. Their beaches, their volcanic rock formations, and many of their species are unique to the islands. There is simply no other place like this in the world. 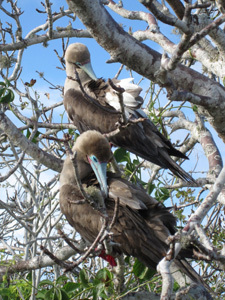 We love the Galapagos, and Global Basecamps’ travel specialists have frequented its shores over the years. There is, however, a better way to travel here. Our simple presence does not have to spell disaster for wildlife, here or elsewhere. This is what sustainable travel is all about. We will not book a trip to the Galapagos Islands for you if it does not meet the high standards of sustainability we have set for ourselves. In addition, a percentage of your travel costs will go directly to conservancy organizations helping to maintain the islands’ ecosystems. You can read more about these standards on our Galapagos Tours page. We could all be better travelers. Part of becoming a better world explorer is realizing that traveling isn’t just about us, but about the destination as well. We are all transformed by our travel experiences, and in the worst cases, we leave our destinations equally and negatively transformed. Let us work together to assure the species that share our planet do not go the way of Lonesome George.